One of our favourite TV shows and contests is The Cube competition – when it’s not on TV we miss it dearly! Highly entertaining in its own right, beating The Cube always seems so close, yet never really seems to happen; the 4m X 4m X 4m perspex cube never has too much trouble getting rid of the contestants before they reach the final game (only a handful have made it!) 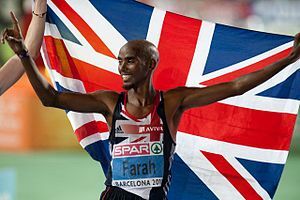 the only person ever to beat it was Mo Farah, the athlete (who seemed to do it rather comfortably!). For the viewers at home there is the opportunity to participate in The Cube competition which gives one lucky viewer the chance of winning a substantial cash prize, usually in the region of £10,000. The viewer has to watch one of the games & then answer a multiple choice question about the outcome. The Cube competition varies slightly from the other itv.com competitions in that you have to watch something happen on the show & then answer the (easy) multiple choice question. It is not a general knowledge question; so you cannot find the answer online. As you can see, you have to watch the show & then count how many times something happens in a pre-recorded clip. It’s pretty easy to count the correct answer if you watch carefully, however if you miss it, most modern televisions allow you to “rewind” – somethine which would never have been possible just a few years ago. Why Is The Cube So Successful? The gameshow itself is addictive and the games are all something we, the viewers, can see ourselves potentially being able to win. This is one of the biggest factors; a good connection with the audience. Phillip Schofield is a great host; he presents this perfectly and is a great professional. Bringing in the family of the contestant adds some humanity to the mix; we can relate to their comments & input. Similar to Who Wants To Be A Millionaire, the show has two “lifelines”; a simplify and a trial run. This brings another tense dimension to the competition. And the show has some amazing filming techniques; freeze-framing, CCGI & slow motion are all used to really add excitement. Then there are the usual “celebrity” charity shows which boost ratings. We feel the strongest reason for the shows success is its design. The “I ccould do that” feeling you get whilst sitting on the sofa, blissfully unaware of the pressure and stress the contestant is under whilst playing the game for hard cash in a plastic cube and in front of a live audience with all those flashing lights! Yeah; you might win in your living room but could you really beat the Cube? They tend to keep it fairly simple, sticking to a cash prize of around £8,000-£12,000 (usually £10,000ish!). There is a new prize for every show – no grand-daddy prizes spanning several weeks. No luxury holidays or flash cars here; just hard cash to do with what you please! So tune in and enter – its clever, intelligent, non-cheesy & one of the best TV competitions since Krypton Factor!